Not to be confused with Madison, Ohio. 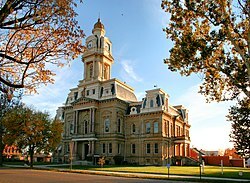 Ohio's location within the U.S.
Madison County is a county located in the U.S. state of Ohio. As of the 2010 census, the population was 43,435. Its county seat is London. The county is named for James Madison, President of the United States and was established on March 1, 1810. Madison County is part of the Columbus, OH Metropolitan Statistical Area. In 2008, Madison County, which spans Interstates 70 and 71 as they converge on Columbus, was cited by the Ohio State Highway Patrol as leading the state for the most speeding tickets 20-mph or more over the posted limit. Despite a population of around 42,000 in 2006, over 7,700 such tickets were issued in three years. Three of Madison County's 18 fatal crashes in 2006 and 2007 occurred on interstates. Madison County is also home to the Ohio Peace Officer Training Academy, the Ohio Bureau of Criminal Identification & Investigation, and several prison facilities. In 1850, the county contained 24 churches and one newspaper office, had a total population of 10,015, and the county's public school system had 3838 pupils. With agriculture as the primary business, that same year the county produced 726,451 bushels of corn, 19,308 tons of hay, 120,696 pounds of wool, and 128,948 pounds of butter. In 1900, the county had a population of 20,590. According to the U.S. Census Bureau, the county has a total area of 467 square miles (1,210 km2), of which 466 square miles (1,210 km2) is land and 0.8 square miles (2.1 km2) (0.2%) is water. As of the census of 2000, there were 40,213 people, 13,672 households, and 10,035 families residing in the county. The population density was 86 people per square mile (33/km²). There were 14,399 housing units at an average density of 31 per square mile (12/km²). The racial makeup of the county was 91.75% White, 6.24% Black or African American, 0.20% Native American, 0.44% Asian, 0.01% Pacific Islander, 0.35% from other races, and 1.01% from two or more races. 0.73% of the population were Hispanic or Latino of any race. There were 13,672 households out of which 35.20% had children under the age of 18 living with them, 59.20% were married couples living together, 9.90% had a female householder with no husband present, and 26.60% were non-families. 22.30% of all households were made up of individuals and 9.50% had someone living alone who was 65 years of age or older. The average household size was 2.62 and the average family size was 3.06. In the county, the population was spread out with 24.70% under the age of 18, 9.10% from 18 to 24, 32.80% from 25 to 44, 22.60% from 45 to 64, and 10.90% who were 65 years of age or older. The median age was 36 years. For every 100 females there were 117.00 males. For every 100 females age 18 and over, there were 121.30 males. The median income for a household in the county was $44,212, and the median income for a family was $50,520. Males had a median income of $35,251 versus $26,119 for females. The per capita income for the county was $18,721. About 6.20% of families and 7.80% of the population were below the poverty line, including 10.50% of those under age 18 and 8.70% of those age 65 or over. As of the 2010 United States Census, there were 43,435 people, 14,734 households, and 10,580 families residing in the county. The population density was 93.2 inhabitants per square mile (36.0/km2). There were 15,939 housing units at an average density of 34.2 per square mile (13.2/km2). The racial makeup of the county was 90.6% white, 6.6% black or African American, 0.5% Asian, 0.2% American Indian, 0.5% from other races, and 1.5% from two or more races. Those of Hispanic or Latino origin made up 1.4% of the population. In terms of ancestry, 32.0% were German, 16.5% were Irish, 14.5% were American, and 9.6% were English. Of the 14,734 households, 34.1% had children under the age of 18 living with them, 55.4% were married couples living together, 11.3% had a female householder with no husband present, 28.2% were non-families, and 23.5% of all households were made up of individuals. The average household size was 2.59 and the average family size was 3.04. The median age was 39.1 years. The median income for a household in the county was $50,533 and the median income for a family was $63,397. Males had a median income of $46,550 versus $33,193 for females. The per capita income for the county was $23,980. About 8.9% of families and 11.7% of the population were below the poverty line, including 16.1% of those under age 18 and 6.1% of those age 65 or over. The following libraries serve the communities of Madison County. ^ "Madison County Online Services". Madison County, Ohio. Archived from the original on 2011-03-07. Retrieved 2010-08-26. ^ Williams, James (1887). The revised statutes of the state of Ohio, Volume 3. The Wrighton Printing Company. p. 583. ^ Gannett, Henry (1905). The Origin of Certain Place Names in the United States. U.S. Government Printing Office. p. 196. ^ a b "State & County QuickFacts". United States Census Bureau. Archived from the original on July 14, 2011. Retrieved February 9, 2015. ^ "2010 Census Gazetteer Files". United States Census Bureau. August 22, 2012. Archived from the original on May 4, 2014. Retrieved February 9, 2015. ^ "U.S. Decennial Census". United States Census Bureau. Archived from the original on May 12, 2015. Retrieved February 9, 2015. ^ "Historical Census Browser". University of Virginia Library. Retrieved February 9, 2015. ^ Forstall, Richard L., ed. (March 27, 1995). "Population of Counties by Decennial Census: 1900 to 1990". United States Census Bureau. Retrieved February 9, 2015. ^ "Census 2000 PHC-T-4. Ranking Tables for Counties: 1990 and 2000" (PDF). United States Census Bureau. April 2, 2001. Retrieved February 9, 2015. ^ a b c "DP-1 Profile of General Population and Housing Characteristics: 2010 Demographic Profile Data". United States Census Bureau. Retrieved 2015-12-27. ^ "Population, Housing Units, Area, and Density: 2010 - County". United States Census Bureau. Retrieved 2015-12-27. ^ "DP02 SELECTED SOCIAL CHARACTERISTICS IN THE UNITED STATES – 2006-2010 American Community Survey 5-Year Estimates". United States Census Bureau. Retrieved 2015-12-27. ^ "DP03 SELECTED ECONOMIC CHARACTERISTICS – 2006-2010 American Community Survey 5-Year Estimates". United States Census Bureau. Retrieved 2015-12-27. ^ Leip, David. "Dave Leip's Atlas of U.S. Presidential Elections". uselectionatlas.org. Retrieved 2018-05-02. Early Biographies of Madison County, Oh. This page was last edited on 3 August 2018, at 16:27 (UTC).